Prepare for the wedding season with bespoke garments from custom tailors with 3 generations of experience. One of the most important events of life deserves clothing to match; Do it without breaking the bank! New York, NY, February 15, 2019 --(PR.com)-- Meeting the exceptional and unique requirements of wedding party orders for the groom and groomsmen is a My Custom Tailor specialty. Typically, a wedding order consists of formal attire for the entire wedding party. The groom may wish to order his custom suit and shirt ensemble in one style and have the best man and the groomsmen order a different combination. The custom-made wedding attire from My Custom Tailor stands out for its commitment to quality and luxury, making a positive impact on how the groom and the groomsmen look and feel. My Custom Tailor offers uniquely comprehensive style configurations, and ordering simplicity to deliver quality, tailor made wedding suits and tuxedos for grooms and groomsmen. 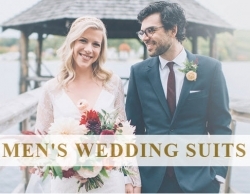 The wedding party can choose from multiple ensemble styles from My Custom Tailor's extensive formal wear collection, including Classic, Exclusive, Premium, Deluxe and Heritage Gold. Measurement forms can be downloaded and submitted easily by the entire wedding party. All items are custom made to the specifications submitted. Be the toast of the party with special pricing on wedding tuxedos. To make it easier for couples to tie the knot without punishing the pocket, customers can now take advantage of the heavy discounts available on the package deal for three men's bespoke tuxedos with two matching bow ties from the Men’s Exclusive Collection. The men's made-to-measure tuxedo suits can be customized with the fabric of your choice: silk, cotton, wool, cashmere, satin, and various other fabrics that can be made crease free and wrinkle proof too. The men's custom-made tuxedo suits include tailor made pants that can be personalized with features and patterns like slim or comfortable fit, broad waistband with extended belt loops, ticket pockets, slash pockets with double piped edges, tone on tone glossy chalk stripes, invisible stripes, pinstripes, subtle inch stripes, among other options. The men's tailor-made tuxedo jackets can also include specialized features and patterns like box pleated pockets, satin facing lapels, notch lapels, semi spread collars, slash or vertical pockets, cuffs with boutonniere, bold stripes, tonal stripes, tone on tone framed stripes, banker’s stripes, subtle tone on tone glistening stripes, pinstripes on herringbone, and many other options. The two bow ties offered with this deal can also be made in different colors and with the fabrics of your choice. Formal wear rentals can run upwards of $300. For another $100 to $200, everyone in the wedding party can purchase custom made formal attire that can last a lifetime. custom made wedding suits that are affordable, look good, feel great and does not punish the pocket!